Kate Orff uses landscape architecture to address climate change and environmental degradation. She is the founder of the architecture studio SCAPE. In 2017, Orff became the first to win a MacArthur "Genius" Grant in the field of landscape architecture. She was also named a United States Artist Fellow. Orff is the author of the 2016 book Towards An Urban Ecology, and the co-author of Petrochemical America. She received her Master of Landscape Architecture from Harvard University, and is the director of Columbia University's Urban Design Program. So when it comes to the natural world, one of the most circular organisms are oysters. RAZ: For starters, they clean water. ORFF: Yes, so oysters can help filter out excess nitrogen. RAZ: They're healthy and delicious and plentiful. ORFF: And it is this incredible source of protein. RAZ: And you can throw oyster shells back into the water where they will help to grow more oysters. ORFF: Yes. Oysters grow on other oyster shells and form these incredibly protective reefs, which form habitats for fish. RAZ: So I guess it's safe to say, Kate, that you like oysters. ORFF: (Laughter) I not only like to consume oysters out of certified waters, but I - at some point back in 2009, 2010 - began exploring oysters as a unit of living infrastructure. RAZ: This is Kate Orff. She's a landscape architect in New York City. ORFF: Yeah. I mean, I am a landscape architect. So I think people immediately assume that means, like, land and gardens for rich people or all the connotations that that comes with it. ORFF: You know, the swamps at the edge of town, the wetlands, the shoals, the shallows, the baylands. RAZ: ...Like the ones around New York City. And more than a century ago, New York's waterways were healthy and thriving and full of oysters. ORFF: Yeah, so there were oysters as big as dinner plates in the Gowanus Canal, if you can imagine that. And around the sort of area where Fulton Street is now, there used to be these oyster boats that would kind of back up to the edge of the shoreline and just open their backs. And then you'd, like, run on and buy oysters or shovel them off. And they were available just regularly on the street, like hotdog carts are ubiquitous today - kind of helped the early New York civilization, if you will, kind of begin to thrive. ORFF: Yeah. There's a combination of factors. But literally, you know, once oyster production and cultivation just became super industrialized, we literally just over-fished and over-extracted all of our oysters. So I would say that combined with emptying sewage into our bays and just industrial waste products contributed to pretty much an all-out collapse of oysters in our kind of water bodies. RAZ: And with that collapse, the thriving ecosystem, the aquatic and marine life, just disappeared. ORFF: I mean, there is a kind of a point at which the physical landscape just breaks down. RAZ: So Kate's been focused on using oysters to try and help restore New York's waterways. 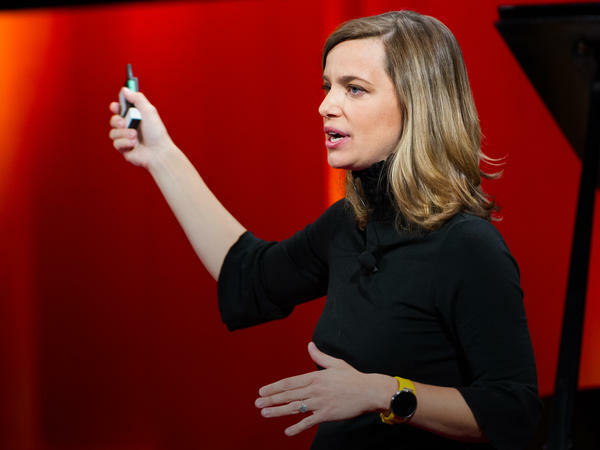 Kate Orff picks up her story from the TED stage. ORFF: So now I want to introduce you to my new hero. And that is the eastern oyster. So albeit a very small creature and very modest, this creature is incredible because it can grow. You can grow it. And it accepts algae and detritus in one end. And then, through this kind of beautiful, glamorous set of stomach organs, out the other end comes cleaner water. And one oyster can filter up to 50 gallons of water a day. Oysters can attenuate and agglomerate onto each other and form these amazing natural reef structures. They really become nature's wave attenuators. And they become the sort of bedrock of any harbor ecosystem. Many, many species depend on them. RAZ: I think that's amazing one tiny oyster can filter dozens of gallons of water a day. RAZ: And so what does that mean? Is the oyster bed literally cleaning the water that it lives in? ORFF: Well, yeah. So oysters are filter feeders. You just imagine an oyster is like a giant stomach that is sort of pulling water through its shell and filtering it out and pushing out that waste product. I think it's important to know that, you know, oysters can't filter everything. They cannot filter out, you know, the kind of toxic legacy of, you know, industrial America. But what they can do is filter out a lot of excess nitrogen in our water bodies. And nitrogen is basically a kind of silent killer, if you will. RAZ: Yeah. I mean, I know that nitrogen comes from sewage and agricultural runoff. But what does it actually do when it goes into the water? ORFF: So literally, it pulls the oxygen out of the water. It creates, essentially, kind of a toxic environment. So tragically, you have these water bodies that are kind of totally overloaded with nitrogen. You have mass fish die-off, or you have mass turtle die-off. And, you know, oysters are a step in trying to reverse that contamination because they do have such incredible, you know, potential to hit the reset button and to bring back the fish. RAZ: And right now in New York, this is happening, right? Like, you are working on a project to revitalize some of these oyster beds around Staten Island. ORFF: Yeah. So the work of the project, which is called Living Breakwaters - it's a rocky breakwater structure that's going to be seeded with oysters. And so it will always have that kind of risk-reducing capacity. But over time, as the oysters grow, it's going to become this incredible new habitat for fish. And that's - we learned that fish, particularly in this urban area in the New York Harbor, have, like, no space for juvenile fish to keep from being eaten by the big fish. So we have this kind of segment of the breakwater itself that we're calling kind of like public space for fish. RAZ: So is it fair to say it's almost like building, like, a coral reef for other sea life? ORFF: Yes, in a way. I mean, in coral reef in tropical or a different environment is performing a similar set of ecosystem services. You know, we were talking earlier about, you know, what was New York like in 1850? You have to imagine these reefs are visible from the surface of the water, right? RAZ: Oh, wow. You could see them popping out? ORFF: Right. They would be popping out of the water. And if you were to be a scuba diver and go underneath the water, rather than flat, muddy bottom that has been where those reefs were erased previously, you would see this incredibly three-dimensional mosaic of spaces. You would see juvenile bass fish kind of darting in and out of these reef streets, lobsters and crabs scooting along. You might even see seals hauling out on the surface of the breakwater itself - just teeming with aquatic life. It'll probably take 10 years, 20 years, but the whole point of the project is that it is not, you know, something that is ever finished. It is trying to set into motion a regenerative cycle. RAZ: I mean, systems in nature tend to be self-regenerating. Like, they tend to be circular and cyclical, and they kind of sort things out on their own. But it sounds like what you're doing is you're kind of bringing humans into this cycle - into the self-regenerating cycle, as well. ORFF: Yes. I mean, I feel like every square inch of the planet has been impacted by human decisions and human behavior. So moving forward, I think we need to kind of think about landscapes differently. And so this - not this kind of notion of, like, well, nature will just come back, you know, by itself. We have altered the chemistry of our water. We have clear-cut forests. We have dammed our rivers and so on. So it's not like we can just stop now and just think that nature's going to regenerate and go back into some virtuous cycle. We have to really actively unmake some of the decisions that we've made in the past and, like, literally give these ecosystems a boost and design our way into them being able to get back into this regenerative cycle. ORFF: Oyster farming and, you know, whale watching and fishing and kayaking and, you know - a whole new recreational economy built around this much more robust ecosystem. RAZ: And swimming in that water, maybe? ORFF: Yes. We researched these beautiful old photos of the south shore of Staten Island and where you have, you know, bathing parties - women in, like, full dresses and, you know, hats. And these landscapes were destinations for New Yorkers. So I think a vision moving forward would be that these regional landscapes of salt marshes and wetlands and reefs would be something that we bring back and feel like, you know, that this nature and the city are not two things that are at odds with each other - that nature is actually being fostered and stewarded by our next-century urbanites. RAZ: That's Kate Orff. She's the author of the book "Toward An Urban Ecology." You can check out her full talk at ted.com. On the show today, ideas about building a circular world. Stay with us. I'm Guy Raz, and you're listening to the TED Radio Hour from NPR.